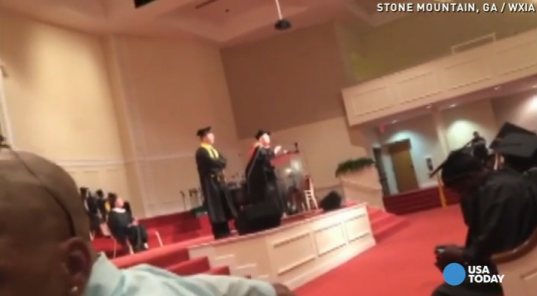 From the video taken at a graduation ceremony in Stone Mountain, Georgia. An Atlanta-area private school called TNT Academy held a graduation ceremony last Friday. The school’s founder, Nancy Gordeuk, mistakenly announced the end of the ceremony before the class valedictorian had spoken. In the process of trying to persuade everyone to stay for the valedictorian’s remarks, Gordeuk became upset that some audience members were leaving. She was also apparently upset that an unidentified man, who she called a “goober” and a “coward,” had been taping the ceremony from near the stage. How do you forget to introduce the valedictorian’s speech at a graduation ceremony? A “goober” and a “coward”? “The devil was in the house and came out from my mouth”??? When you tell everyone to leave your school’s graduation ceremony because you’ve forgotten about the valedictorian, then you change your mind, then you become increasingly unhinged in your remarks about a guy who had a camera, why is the race of the people who are quite reasonably leaving the scene of your weird meltdown the first thing you seize on by way of explaining to yourself why they’re leaving?